A Stranger in a Strange Place, Yeah? that believe him at fault. After all, why was a human-born there on that night, before the cage?" Bond: As a young boy I was selected to be the Archdruid's personal scribe, the one who writes their thoughts, lives beside them, and the one who understands them best. Even though my family lives, I look to the Archdruid for my wisdom. Ideal: Improve your immaterial self and your material self will follow, ruin your immaterial self and your material self doesn't matter. Flaw: Fey mysticism and dreams oft cloud the more physical dangers, though, I still follow the guidance of my unwaking dreams, even if they are proving dangerous and hollow. Appearance: Lanky, but not elvishly tall, Huern is actually rather short for his bloodline and does not cut an imposing figure in the least. The half-elf's spindly body is surrounded by a long-tailed overcoat lengthy enough to reach the floor and one gifted to him by his mentor, with the patches of office sown over. Within this dark, green and purple vestment are a selection of scrolls and books, tucked and managed by the overcoat's holsters. He paints lines and symbols on his body as a way to better connect with the spiritual realm, each one following the immaterial veins that run through the Feywildian stream that runs even clearly in his half-fae body. Hair a mess, stained patchy green from communion with nature, his face is only framed by the wild tendrils, flailing about above his grey-colored eyes. Personality: After a life wholly dedicated to the preservation of the Druidic way, my mind can only comprehend the world as such; which forces the outside world to crack my head like a nut before I can grasp outside thought. In polite society I often can be heard humming, not used to many others near me and forgetting where I am. This is only concerning when the tune stops and my eyes roll back, as it means I've fallen into my habit of spirit sensing and have forgotten the material world in exchange for the dreamscape. While I am fully cognizant, I try to be amicable, as the time I have is fleeting. Backstory: A child of a human and a Riverwalker, one of the guardians of the ancestral lands that hold vigil on the Evoss, Huern was evacuated from the site not long from his birth. Only his father was ever able to see the young half-elf, the mother, a human, was unable to enter the forests of Areth Taesi both for her safety as well as the safety of the elvish populace; hostilities as they were and still are. Though, not long into his life, it was decided that Huern's father was unable to see to him properly and the child was put to the council's decision. They ruled him, one of shorter life and less prospect, to be a scribe, one that would aid the Druidic Circle deep within the forest and take notes for further study and reflection by druids away from the forest. A tenure from early life to recent was fraught with discoveries, personally and spiritually. Given his full name and reborn amongst the circle, Huern Haive Amiliya'goule was fancied immediately by the Archdruid for the spirit he held within, something one is born to and only moldable by divine natural awareness, one that the scribe seemed cursed to have. Most spirits had been formed around the life of a creature, big or small, and most commonly took the shape of an animal, a bear, a scorpion, the like. This spirit being the one that the body is most easily identified as and, by druidcraft, shiftable into. Huern's however, only looked as he always had, making his form all the more difficult to be compelled to change. Taken as the Archdruid's personal scribe, both for his spiritual phenomena as well as the endless need for note taking of their thoughts, Huern learned only of the difficult study of druidcraft for years. His teacher, though not in name but through idol worship, gave him many secrets, those that would die with him and be bound to paper after the scribe was gone. The events of a certain night, one that brought the typically somber setting of the circle to a frenzy was loosed from Huern's mind. In the dreamscape, viewing the world through the immaterial as per the Archdruid's word, the half-elf was without full context that night and in the immaterial all he saw was a black cage, impossible in the dreamscape and two silver eyes that rest within the shattered piece. Ones that the Archdruid made him repeat over and over, were not there. Even though he saw them and the dreamscape never lies. Whatever had transpired brought the circle to a tizzy and for a second time in his life, the boy, now man, was brought before the council to be meeted upon. And their judgement was sound. A journey he would have to take, one that they didn't deign important, but needed a guide for posterity's sake. Something that was oft considered suicide for an elvish druid. The best kind of task for someone who had seen something they shouldn't. The shapeless druids scribe was to convene with a priestess and her entourage as a good-will envoy of Areth Taesi, to make use his wealth of knowledge; as the circle found another scribe. RP Sample Grey eyes flitted about the clearing, a dim light seen only through the loosened branches and vines allowing a modicum of his vision to be granted. A blessing from the Archdruid, a whole elf, or, it was likely they were. The wooden mask that always was perched upon their head and the cloak around it that concealed all but a few strands of silvering hair to the close observer. "What.. what did I just see?" Huern's breathe was thick in the air, the chill of the outside keen to show it's tell-tale signs. His eyes, still looking about abruptly stopped as the clearing birthed a pink light in the center, blinding him for only a second before the scribe was back to seeking an answer from his teacher. Their face seemed immune to the shock of light and it was the same pink glow that the Archdruid favored, so the brilliance had likely come from them. "That was the Beastlands. Your only gift." the wizened sage uttered, in a tone of exhaustion that the researcher was unused to. "Memorize what you saw there, the animals you viewed and the strife that will foretell the coming days. Memorize it, scribe the details, but now for yourself." "I... Archdruid? What did it all mean? There were seven myself included, but... the eyes... they were also-" The young one pulled at his overcoat, scrambling to grab at the contents - the books and scrolls within. Something to detail what he had seen. "Don't speak of the dream!" The pink light erupted, blinding him once more as the Archdruid, their emotions spiking, shouted at the disciple. "Memorize your vision of the Beastlands, figure out what it means, then come back to the grove when you have. When you do, if you do, all of your questions will already be answered." Huern, dragging quill across paper in a furious ledger of his guided vision, looked up, still rubbing his eyes, multi-tasking his effort as he gave a glance to the Archdruid. Their visage the same as ever, the mask hiding all, the half-elf returned to his work. Small notes littered the edges by the time he had finished, but in the center of the two-page druidic prophecy sat a drawing. Six animals, a small settlement, and his own unmolded spirit, following a twisting trail, all interwoven, but for only a short time. And hovering over them, two silver eyes. Everything will be answered... huh. Bonus RP Making a steady pace, a dirt road etched not by the wilds, but man, stretched before Huern. The young druid stared forward unflinchingly, as he passed by humans, eyes fixed forward not for lack of care, but uncertainty. Discomfort pervaded his travel, no hum of music or his comforting dreams were allowing him the neutrality of unknowing the spirits around him. Huern had to know if they were human or not as, even though the vision showed him arriving in that settlement, it was unclear of the safety of the venture there. Ahead, a merchant peddled his wares on the side of the road, stopping for a passer-by. A dwarf and human. Tapping his gnarled walking stick before him, the half-elf began his ritual of walking in the blind, turning to the dreamscape even as he knew it would be reducing his material vision. What do they look like? Are they two of the six? Do we meet parsed between the paths? The scribe was always curious, unsure of his to-be compatriots beyond the spirit animals they were. Eyes rolling back, stick, a highly-natural presence, still gripped in his hands and tapping forward like that of the blind, the druid shifted his purview to the immaterial. Before him, the road, naturally tamped down but of wholely minerals, stood still. The cart, sans horse, was gone and beside the horse restrained to air were two glowing presences. The snakes eyes flashed greedily as it looked within the sack, eyes replaced by dull-looking brown ones as the dwarf came back into view and Huern returned to walking materially. Catching his gaze, now not glazed over, the dwarf waved an empty hand over and called for his attention. There were trinkets and bobs for sale after all. "Er, no. I... thank you, but I need to continue unabated. I'm headed for a spiritual site in Kersdinas and have to be there right before the mongoose or the dog might..." he trailed off. The eyes of the dwarf glazed over, calculating the value of listening to him, likely having stopped half way through. There is the snake, you can always see through their eyes. But the snake is right of mind, there is no time to dally. Waved off by the merchant, Huern stared forward again, more steady of step after a non-hostile interaction. Thinking back to the Archdruid's words, the half-elf had to think, will this journey be as dangerous as they said? Even the snakes are semi-hospitable. Maybe the path ends so abruptly for reasons other than suffering. Knuckling his walking stick to the side, Huern's lips turned up at the idea. Last edited by Maskain; 02-01-2018 at 04:12 AM. Name: Brother Qu'hier'ren, a.k.a. "Wren," "The Laughing Blade," or "The Grinning Idiot"
The Monk, All Races The Brotherhood of the Last Banner was an order founded in the direct aftermath of the decisive battle between Orcs and the unified races. Their initial duty was to guard the southern borderlands that the orcs retreated across after their defeat. With no strong warchief for a thousand years, the orcish threat has greatly subsided and the Brotherhood branched out and began guarding and protecting the Sanctaid and other holy sites including the recovery and safeguarding of relics sacred to the Martyr and Bartholomew Wraith. The Brotherhood resides deep in the mostly uninhabited lands in southwestern Rhyfel, surrounded by numerous Orc ruins. Largely unknown in the greater kingdom, the Brotherhood is considered a relic of a bygone era to those who are aware of them. Upon returning to your lodgings one evening, an unsigned missive awaits you. It is a new mission from the order: a Priestess has been chosen for the first time in ages, and she is to carry a holy relic of Evelyn to the Sanctaid as offering to the goddess. You are to meet a contact in Coedtref and ensure that the holy relic reaches its destination. The delivery of the relic is paramount; the safe arrival of the Priestess and her Knight is not. I am have an unshakeable optimism. Beneath it is a steely faith that verges on fanaticism. I have a strong code of honor that those from the Kingdom of Rhyfel don't quite comprehend. I would give my life for my Brothers. I hold no greater cause than my service to my order. I live by the Brotherhood's motto: "Once we were Brothers, and Brothers we shall ever remain." I have much to learn from the kindly folk I meet in my journies. The rift between the races could be healed if they were to remember the Last Banner. The leaders of the Brotherhood always have the order's best interests in mind. Appearance: Wren is of middling height, but with the chiseled build of a prizefighter. Although there is a hatchwork of scars and tattoos decorating his face and the visible skin of his arms, they do not detract from the youthful exuberance of his look. He has often been called handsome, although he considers the compliment quite odd. The tips of his ears and the angularity of his features hints at some Fey ancestry. He usually wears trousers and a sleeveless tunic (when he remembers to wear it) made of dark gray, homespun linen. The hooded cloak draped around his shoulders is made from a rich cerulean material. Stitched in golden thread on the right breast of the cloak is a crest most in the Kingdom of Rhyfel have forgotten: the symbol of the martyr encircled by multiple insignias representative of the other races. Although proud of his heritage, Wren will hide his ears and more elven features within the cloak when circumstances dictates. Personality: Wren has an optimism that is both optimistic and infectious. He has an easy laugh, tends to be generous with compliments, and moves with a boyish energy. Undergirding his optimism is the honed discipline of a militant monastic order. His idealism stems from the Order's believe in unification by remembrance of shared history; his resolve is rooted in his devotion in seeing this ideal be made reality. Whether sharing a tale over a cookfire or dislocating someone's jaw, Wren tends to wear the same smile. Backstory: The Brotherhood of the Last Banner is an ancient, all but forgotten order located in the kingdom's mostly uninhabited southwestern regions. Their sacred charge is to recover and safeguard relics and sites holy to the Martyr and Bartholomew Wraith. For many years after the Martyr's sacrifice, children of all races were sent to the Brother's so that they may fulfill their blessed mandate. Sadly, over the many years since the decisive battle the old agreements have either gone ignored or all but forgotten. Now what remains of the ranks of the Brotherhood have become a mottle of unwanted half-breeds, outcasts, and those few that cling to the old ways. Qu'hier'ren was left at the Brotherhood's fortress at a very young age. His mother's face is indistinct in his memory but her voice and the scent of lilac lingers. He was made a ward of Elder Sister Sannela, a doughty old dwarf who adhered to the covenants of the order with a fanatic's zeal. Sannela instilled in Wren and her other charges her devotion to the principles of the order and all of her martial knowledge. Initiates of the order are ordained as full brothers or sisters after they have recovered an ancient object from one of the many orcish ruins or ancient battlefields littering the kingdom. Before Wren could return to the fortress with his discovery he received a missive from the order: a new Priestess has been selected and she is to deliver a holy relic to the Sanctaid. He was to meet a contact in Coedtref and join the Priestess's retinue. From there he was to ensure that the relic reached the Sanctaid; the arrival of Priestess and her party was secondary. Now a fully ordained Brother (at least so he thought of himself, the letter hadn't said anything conclusive either way), Wren set out for Coedtref as quickly as fate could carry him. "Come now! Weren't we all brothers and sisters once? Surely there's no need for this?" The town of Waymont wasn't a bustling cultural hub by any stretch of the imagination, but it was just large enough and just close enough to the trade roads to have a criminal element. Wren had been to a series of nearby ruins in search of an artifact, and after spending days-going-into-weeks in his search he had finally found an old war banner. An old war banner that had apparently served as a loincloth for several generations of orc before being unceremoniously shoved into an old clay pot. Wren had just come from retrieving the banner after it had spent a full week with a launderer, when he was set upon by three of Waymont's would-be brigands. The three men laugh nastily in response to Wren's entreaty. "Brothers ya' say? Well brother'n to brother'n, hows'bout you 'lend' us whatever ya' gotten the coin purse? That cloak and the steel slung over'n ya' shoulder looks ripe for borrowin' too, so you jus' toss'm here with no funny business, ya sav'?" The brutish trio had the lean desperation of starving men. Two of the men, the one just behind him and one of the pair in front, held their daggers in novice grips as they shot nervous glances from Wren to the opening of the small alleyway. The third man was much more self-assured and he wielded a short sword that had obviously seen better days, but was still in good enough condition for the committing of dastardly deeds such as this. Wren was certain that only the leader had any real martial training, but it was well known that stray dogs made up for their lack of strength with a doubling in their viciousness. Shrugging nonchalantly to himself, Wren removed his coin purse and tossed it at the feet of the men before him and then he removed his cloak and threw it to them as well. After a moment's contemplation he added his shirt and boots to the pile, even though they hadn't asked for either, and so he soon stood in the middle of a random alley in a podunk town stripped to nothing but his trousers. Still, these men had made demands first instead of just shivving him and leaving him for dead and that was a reason to continue smiling. "Ohho! Look here gents! Looks as if we have'n ourselves a Prickee- "
"...pardon me ya talkin' dunger, what'n you just said?" "I said half. As in I am half a 'Prickee', as you so eloquently placed me. Either my mother or my father was Prickly, and pricking a Prickly makes me half a Prickee... you see?" The three brigands share a bewildered glance between themselves before they erupt in laughter. There knives remained angled at Wren's throat and back though, and his smile never wavered. The leader of the thieves wiped a tear from the corner of his eye as he took a step closer to the young ascetic. "Prickin' a prickly, that's a good'un! Tell ya what: give us the parcel there an' we won't bugger the Prickee half'n ya, and leave ya here in this'n alley. That sounds more'n fair, sav?" After the latest offering, the laughter in the alley turned a great deal more malicious. At this, Wren's smile did droop but towards something more earnestly despondent. He shook his head and then stuffed the parcel into the waist of his trousers at his back. "Sadly, this item is one thing that I cannot part with. You see it is an ancient relic and considered quite valuable by my order. Hopefully you understand and will not think poorly of my lack of charity..."
The hunger in the men's eyes intensified at the words 'quite valuable' and all three began to further advance on Wren. Their leader stops when the point of his sword is a scant hairsbreadth away from Wren's nose, and the man then looks Wren in the eyes and his yellowed teeth flash in a nasty smirk. "Welp, a buggerin' it is then!" Elves are the best for punchin'. With all them pretty teeth, makes it real easy to pick'm out of your knuckles! Harharhara! Sister Sannela had a terrible habit of laughing at her own jokes while trying to deliver a punchline, but her wisdom was always sound. 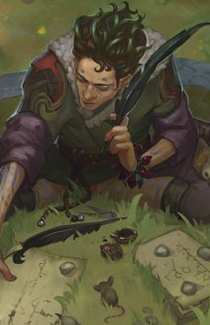 Wren remembered the tidbit of sagacity as he walked through the door of the Stem and Stein, the worst of Waymont's small handful of inn's, but the best that he could afford with his very meager purse. The roughness of the establishment worked in his favor as no one asked him any questions as he flicked bits of yellowed teeth from his knuckles and elbows, nor was there a fuss made as he dripped blood from a shallow cut along his ribs as he crossed the common room. He had been careless; his one last entreaty to peace had almost ended with a knife in his liver when one of the bandits had been clever enough to fake a surrender. It was that man's teeth that Wren had plucked from his elbow, and the young ascetic was saddened by the idea that the men may never eat solid food ever again. These thoughts preoccupied him as he climbed the rickety staircase up to his room. A cursory glance showed that no one had let themselves in during his absence; they had finally given up after tossing his room for the first week of his stay. Qu'hier'ren opened the door to his room only to freeze in the doorway as he spied a sheet of parchment laying neatly folded in the center of his mattress. After quickly sweeping into the room, he immediately began checking for signs of forced entry, but finding everything as it should have been he closed the door to the room and sat down to read the letter. "Martyr's blood, not more poetry..."
Elder Sister Sannela was quite fond of penning her own poetry, and her output was rather prodigious. She was known to have initiates commit loud recitation of her verses while she was in the middle of punishing them with grueling physical exercises. Qu'hier'ren had sung so much poetry that his nickname's relation to his actual name had all but been forgotten. It took the young warrior full read through and a half before something in his memory clicked, and then he read through the missive twice more. Evelyn's mercy, there's a new priestess! ...FIRST MISSION! MY FIRST REAL MISSION! Qu'hier'ren leapt to his feet with the sudden realization: he was a full fledged Brother of the order now. Even without returning with his relic, the Elders had finally acknowledged him and he was being sent on his very first mission! Quite the mission at that: accompanying the first priestess procession to go to the Sanctaid in very many years. They couldn't have possibly assign him so important a task and yet still deny him, could they've? He pushed the possibility form his thoughts while spreading a map across his mattress. In reading the poem again, he deciphered both a place and a name: Coedtref and Dacus. The former he knew as he began to plot a journey from his Waymont to there, while the latter rung no bells. Should be easy enough to find this Dacus; not a very common name in those parts. Hmph... Five days travel, give or take fair weather, bandits, and the occasional borrowed cart ride. I'll have to leave now if I don't want to sprint the whole way there. He laughed to himself as he gathered his meager possessions. One of the many benefits to living so austere a life was that it made rapid departures rather easy; tidying the room took a longer time than did the collecting of his belongings. Wren then kept a steady watch between his door and the only window in his room and after the day had progressed well into dusk, he slipped out his window and onto the roof. He made sure to draw the curtains and close the window and before he was off bounding over rooftops, it looked as if the room had never been occupied. Last edited by Anazider; 02-02-2018 at 02:42 PM. I finally got my story done! Picture soon to follow! 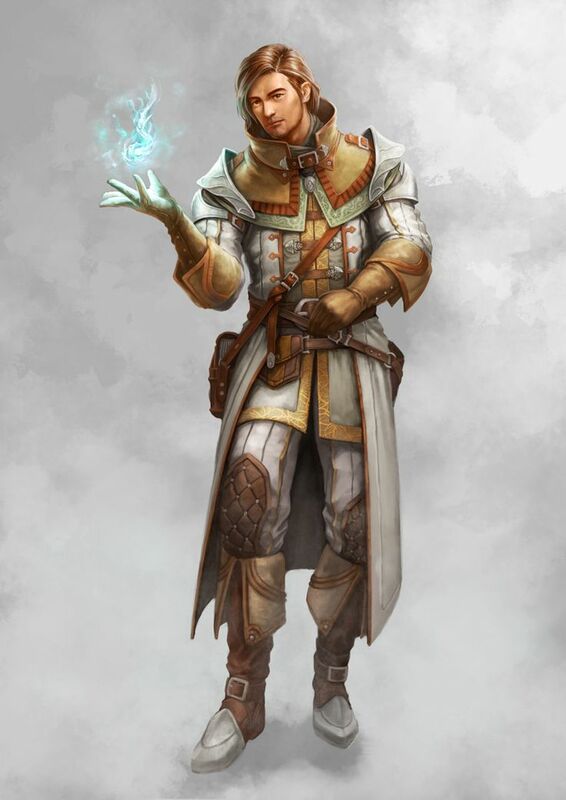 •	Appearance: Cornan is of average height for a human, but heavier of build than most wizards, a consequence of his upbringing on the streets. Being an orphan and homeless, he had to learn at an early age to take care of himself, and he did all manner of odd jobs as a child in exchange for food or board. The simple grey robes that make up his daily attire reflect his status as a student of magic. The only adornments that make him stand out from the other students are a worn leather belt with a fine steel dagger attached. Usually students are not allowed to have weapons, but this dagger has much sentimental value to Cornan. It was the very first thing he bought with the money he earned from doing magic tricks. He is usually also carrying a carved quarterstaff, given to him by his teacher at the beginning of his 6th year of study. In his bright blue eyes one can see quite a bit of intelligence, as well as a thirst for knowledge. His brown hair is kept cut short, in accordance with the rules of the school of magic he attends. •	Personality: I have always had a knack for figuring things out. When I discovered I had magical talents, I sought out a place where I could expand my knowledge. Since beginning my magical studies 8 years ago, I have been entrusted with maintaining the master’s library, and in return I get a chance to read and absorb all of the knowledge in these books. I have learned much during my studies, but as the saying goes, the more you learn, the more you realize how little you know. •	Backstory: As a young homeless lad, Cornan did what he could to survive. He did odd jobs around his village, loading carts, unloading carts, making deliveries, cleaning halls, anything that could earn him some food or a place to sleep for a night. Around the age of 12, he discovered that he could…do things. He could make things float if he concentrated hard enough, he could make fire erupt from his hands, he could make things disappear. He could do magic! By the gods, he was a wizard! Well, not really, but he had heard stories of powerful wizards who could do AMAZING things. He started to earn money doing simple tricks for people, but one day some older boys jumped him in an alley where he was bunking for the night. They tried to steal his money, but fright caused him to lash out with whatever magic came to mind. With a wave of his hand, he sent his attackers flying back into the wall of a building with a sickening thud. He had to find a way to harness his abilities….and a more conventional way of protecting himself. That very afternoon, he bought a fine steel dagger with the money he almost lost. The next day, he began inquiring around the village about a place of magical studies. He asked around the tavern, the inn, and several shops in town asking if anyone knew of such a place. A stranger in the apothecary shop informed him of a wizard in the capital city of Kersdinas, a man named Kamaex. After learning which direction the capital was, and gathering some meager provisions for the journey, he set off toward what he knew in his heart was a bright future. Upon reaching the city, he asked around until he found his way to the tower of Kamaex. He knocked on the heavy door to the tower, and once someone finally answered him, he asked to be allowed to see the master of the school. After introducing himself, he asked Master Kamaex if he would be willing to take Cornan on as a student. The master looked him over warily for several seconds, and then asked him for a demonstration. Cornan began to perform some of the tricks he had taught himself. He decided to save the fireball for last, because he thought that might impress the master somewhat. Cornan successfully performed each trick, all the while looking at the wizard to gage his reaction. Master Kamaex called a halt, and looked Cornan over again, his hand stroking his long beard. Cornan stood there exhausted, anxiously awaiting the answer. After several minutes, Kamaex smiled and placed a hand on Cornan’s shoulder. “You are quite talented, young one”, he said. “I do not usually accept personal students, but I sense something special in you. I would be pleased to have you study here. But be warned, the studies will be difficult, and you will greatly tested.” Cornan could barely contain his smile and accepted the offer quite graciously. He studied intently for 8 years, and the more he learned the more he wanted to learn. His eagerness for knowledge seemed to have no bounds. He learned spells from all schools of magic, not being pleased with any one discipline. He found that he quite enjoyed evocation and conjuration spells however. He became a personal assistant to master Kamaex, and began running errands for him when not involved with his lessons. •	Bonus RP: There was a problem here, Cornan knew it. Master Kamaex was increasingly irritable and secluded recently, and he had been sending Cornan on all manner of strange errands. He asked daily if there was anything he could do to assist his master, but Kamaex merely grunted and sent him on yet another seemingly meaningless errand, this time to gather holy water from the font of Evelyn. Yesterday it was a strange mirror, the day before a package from the royal barber. Cornan was one of the top students in his year, and he had an innate talent for magic. Plus, he was master Kamaex’s personal assistant for a reason, was he not? When he was not searching the library for ancient texts, he was searching for reasons the master might be obtaining some of the items he was. One evening, he found something mentioning a type of divination spell using a mirror and holy water. What would the master be divining? The constant trips to the palace made Cornan very curious. Could it have something to do with the king? What could be wrong? He made a mental note to be more observant around Kamaex, but he knew he would also have to tread lightly. Kamaex was usually very understanding, but in his current state, Cornan did not want to cross him. And a couple more app reviews. I think that is all the completed apps reviewed. If I missed anyone, just post a message. Apps close on Friday, February 2nd! So if you're interested, times ticking! Last edited by Andor; 01-29-2018 at 11:12 AM. App edited and picture added. Good luck to everyone!